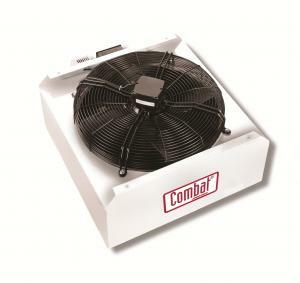 The Combat HVE range of fans is primarily designed for installation in high bay applications to return warm air down to ground level [destratification]. With any conventional warm air heating system, natural convection increases the temperature gradiant. This results in the ambient temperature at the apex of the roof being greater than the required design temperature in the occupied zone at floor level. By using a system of destratification fans, the hot air in the roof space is directed down to the required area, thus reducing the heating load. Fans are supplied with built-in thermostats to allow for automatic stop-start operation when the temperature at the fan location rises 3°C above set point. Complete fan information and selection / sizing information is included in the product brochure. For applications where cooling is also a factor consider SkyBlade HVLS fans.